Warren Floyd Reams quietly passed away with his family by his side on February 2, 2012; he was 91. 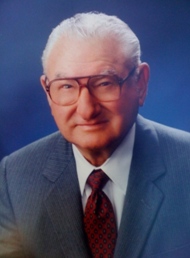 Warren F. Reams was born in Fort Lyon, Colorado on August 15, 1920 to Floyd U. and Josephine (Nerger) Reams. He married Leatha Nora Dean of Gunnison on June 18, 1942 in Leadville. He joined and served in the Navy from 1943 to 1947 as the Chief Petty Officer and drum major on Catalina Island. He graduated from Western State College of Colorado (1950) and Westminster Law School (University of Denver) (JD, 1954). He was a distinguished and valuable member of the Grand Junction legal community for fifty-six years, serving and supporting many organizations, such as St. Joseph’s Church; Community Concerts; Mesa County Bar Association (he served as president in 1964); Assistant District Attorney, 7th Judicial District; Knights of Columbus, 4th degree (Former Grand Knight); and Kiwanis Club of Grand Junction (former president and lieutenant governor). He is survived by his wife of sixty-nine years, Leatha; brother, Dwight Reams of Holdenville, Oklahoma; sisters, Deloras Kirby of Phoenix, Arizona, and Tina Jones of Woodland, Texas; four sons, William (Pat) of Las Vegas, Nevada, Melvin (Diana) of Denver, Charles (Sally) of Grand Junction, and Paul (Amy) of Las Vegas; seven grandchildren; and five great-grandchildren.